Sherlock Holmes is back in a brand-new feature length story. With Watson's literary career going from strength to strength, he secures a slot on local radio to publicise his new book. Uncertain as how to well it went, he is still a little surprised when the recording isn't broadcast. Although disappointed, he disregards this snub to his confidence as a peculiar but unimportant bend in the path of his literary career. The Darlington Substitution can be read for free now on the Indipenned website or via the Indipenned Facebook. 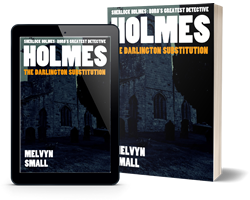 Alternatively, you can buy The Darlington Substitution from Amazon on Kindle or paperback.